After the last post I can say that limited run is doing Axiom Verge 100%. But hey, at least we will get the game. -SV- wrote: After the last post I can say that limited run is doing Axiom Verge 100%. Well, Americans get the game. Obviously a pro for them but as it won’t run on a PAL console it will leave us high and dry. I guess there’s a chance LR do a PAL pressing (all other consoles they have released on have been region free so we have no real precedence to go off). I doubt they will though. Is there a link? I very much still want this. 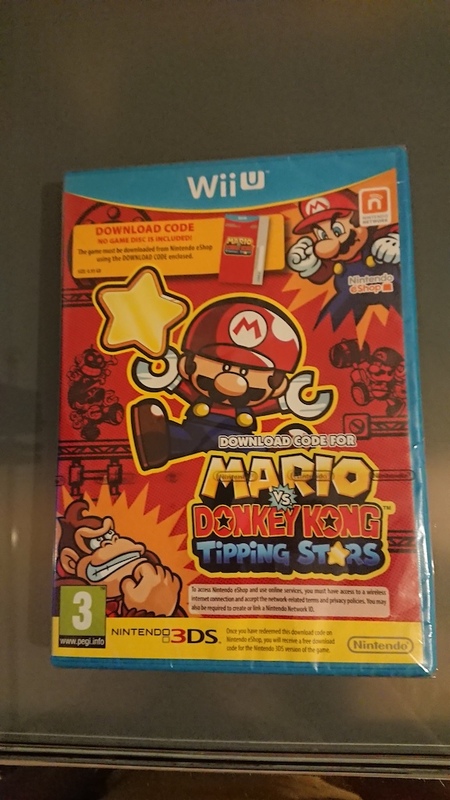 So I finally piked up a copy of Mario vs Donkey Kong. Now when you move the box around it sounds like something is loose, normally I'd just go loose disc but seeing as it's a download code in a box what is moving around? Don't think there's many more games to go before i have all the ones I want for the system. Is this code so much rare in English ? In french, it’s not so rare. For you question, i can say that there’s also a sound when I move my box, I guess it’s the code and the other stuff with it. Been 2 months since I contacted badlandindie about Axiom Verge so have sent them another message - will let you all know what they say. Inirius wrote: Is this code so much rare in English ? In french, it’s not so rare. I don't think it's that rare in "English" either (the triangle is grey). It comes up on ebay, which I'd advise waiting on a decent price, and Amazon has re-stocked it on and off, which has been the cheapest I've seen it (around or maybe slightly under £20). Lately not seen it anywhere else than Ebay, but I'm also not looking for it. Inside? I have one opened, one sealed UK and it's got paper in there is all, including the "scratchcard". My Japanese one had a loose disc, so I'll have to buy another, but I want to think about getting a folder to buy loose discs and put them in as I really do like the Wii U discs (both the artwork and their round cut edges). Well, you could just say PAL instead since Australia/NZ are part of the PAL format rather than moreso only in the European continent. But to be honest, I get that it's bad news for collectors but not in general for people (i.e., there's a lot of negativity and trashing the continent for this and that). looks like most stores didnt even take that in list anymore....gamestop didnt have wiiu version in example. Wow.. epic wii u stuff you collected. I think i'm done collecting for the console. I missed some special editions, the English Zumba and i don't think i will ever find a Pokemon rumble U. Maybe sometime i will hunt down the NTSC only games. Until then this is my collection. Deanos wrote: I think i'm done collecting for the console. I missed some special editions, the English Zumba and i don't think i will ever find a Pokemon rumble U. Maybe sometime i will hunt down the NTSC only games. Until then this is my collection. Do we have any news on LRG#1? I thought they said that it would be up till January... but it's February. Wow ! That’s great ! Congratulation ! So i guess that you’ve already got the English Cabela .